I've always shared a special bond with Halpin. We first met working at Adventure Cycling. Back then all we talked about was pro cycling and triathlon. The pro cycling thing didn't work for me so I created a blog :), but Brendan has really stepped up his game. He is now a pro triathlete, and has structured his lifestyle around making that next big step. I'm super proud of him. Last year was a breakout year with your win at Wildflower, what has changed for your this year)? Brendan: This year is going to be a big one for me. I nailed down how to race a Half Ironman this year and the goal this year is to really learn how to race Ironman. I will be racing Ironman St. George on May 1st along with TCH co-worker Jen Luebke. It is an early season race but the Southern weather and training should set me up for a great race. 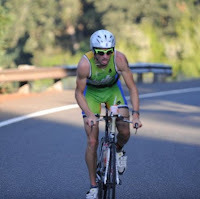 After Ironman I plan to take a little break and do some bike racing then hit the 70.3 scene for the rest of the season. This year I will be racing for the Zoot Ultra triathlon team along with Adam Jensen, and Jen Luebke. The sponsors for the the team include Orbea, Zipp, Suunto, and Zoot for clothing, wetsuits, and shoes. What bike are you rolling this year? Brendan: I will be rolling the Orbea Ordu w/ Zipp wheels. I'm super excited to be riding Orbea, they make a great rig that I think is among the most aesthetically pleasing bikes on the market. I will also be hitting up the MT road races whenever I can. I love racing the Montana road scene! What has the Cycling House done for your triathlon career? Brendan: The cycling house has set me up for a great triathlon career. The work schedule allows me the time to get in some great training and also forces me to get in some easier rides. Training in Montana all season makes you tough but training in Arizona makes you tan and thats what really matters. Owen has a great business with TCH and our staff makes it a blast! We get to meet a ton of awesome folks who are always willing to give advice. I have actually met quite a few great mentors at TCH who have been very helpful. The season at TCH is shaping up to be a busy one and the staff is already looking fit, tan, and jacked. The world better watch out for TCH employees at the races this year. What are your predictions for the Grizzly Triathlon?